What if you could share designs and manage reviews in one template? You’d get actionable feedback, faster approvals, and better work. For design teams, managing feedback and approvals can be the most challenging part of the creative process. Things quickly become confusing when you’re trying to keep track of input from multiple stakeholders over several rounds of review. Streamline communication. Speed up the review process by sharing designs and feedback in one place, so everyone knows exactly where to find what they need. Gather input across review cycles. Never lose track of important input again by keeping past feedback, reference materials, and questions together with your design files. Make feedback actionable. Ensure reviewers have relevant information and context so they can give helpful input. Visualize your approval workflow. 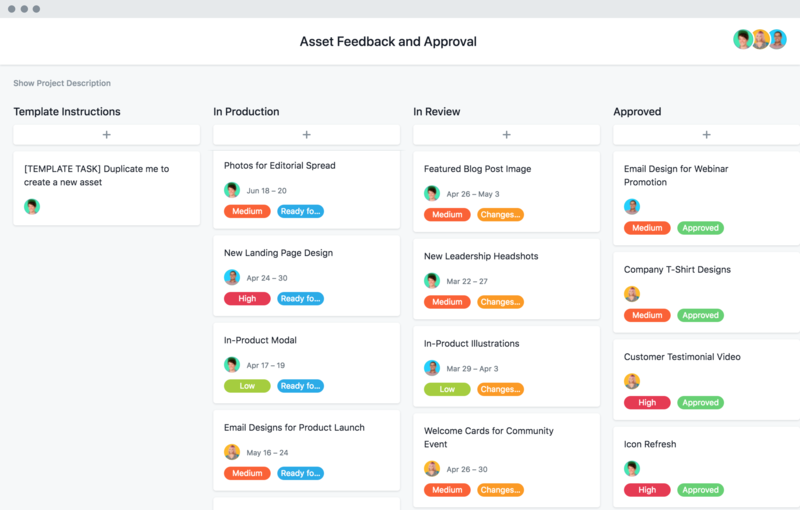 Easily set up a kanban board to show which assets are in production, in review, or approved. Sony Music increased their production by 4x, and was able to better compete in the world of digital music. Giving and receiving cringeworthy feedback can stop projects in their tracks. Try our tips to keep your team’s creativity flowing. If the creative approval process feels like a broken roller coaster, these tips can help you smooth it out. How do you plan highly collaborative campaigns and give feedback across a remote team? Find out and follow along with our webinar. Effective critiques can be just as important as the designs themselves. Learn how to organize and action feedback from crits.